During the last few years, standardization was identified both by the European Commission (EC) and by industry as a new issue of strategic importance for the creation of markets. It was one of the concerns of the EC, especially of the Embedded Systems Unit of the Directorate General 'Information Society and Media', that the results of funded research projects are having only a minimal impact on standardization. The Standards Working Group of ARTEMIS, the European Technology Platform for Embedded Intelligence and Systems, proposed an FP7 support action ProSE (Promotion of Standardization for Embedded Systems), to promote standardization in the (dependable) embedded systems field. This was accepted and it commenced in May 2008. In the 6th Framework Programme, the COPRAS (Co-operation Platform for Research and Standards) initiative was created, linking research and standardization in different areas, mainly outside embedded systems. The work resulted in several action plans for specific domains, which provided some guidance as to how researchers and research projects could achieve some impact on standardization. The major problem is to find sustainable solutions to perform this task, since  taking into account that research results are only available as projects come to an end  the time schedules of new or evolving standards are outside the scope of research projects. 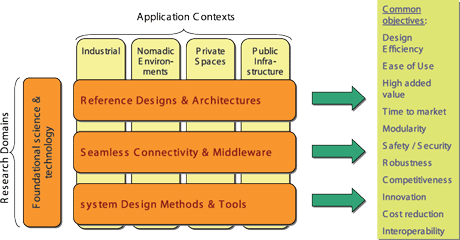 Figure 1: ARTEMIS SRA segmentation with respect to research domains and application context domains. In the 7th Framework Programme, ARTEMIS, the European Technology Platform for Embedded Intelligence and Systems (now part of a 'joint undertaking'), focused on a variety of dependability issues relating to (critical) embedded systems and was mainly oriented toward systems and software. It organized a standards working group to prepare an ARTEMIS Strategic Research Agenda (SRA) for standardization (as a supplement to the ARTEMIS SRA, see Figure 1). This work will now be performed as part of the ProSE project, with the long-term objective of having ARTEMIS act as a supporting organization that will take over the Strategic Agenda for Standardization as part of its long-term strategy. The partners in this project are Thales SA (co-ordinator, France); FhG-IGD (Darmstadt, Germany); ESI (European SW Institute, Bilbao, Spain); Austrian Research Centers  ARC (Austria); AVL List (Graz, Austria); ST Microelectronics (Belgium); Commissariat à l'Energie Atomique - CEA (France); Acciona (Spain); and Ericsson AB (Sweden). This represents a good mix of research and industry, with both groups represented by partners involved in diverse fields of dependable embedded systems research, applications and standardization. ProSE is driven by the ARTEMIS Technology Platform's objectives, which are to overcome the fragmentation of industry and research in the embedded systems sectors, and to support the embedded systems industry such that it is able to supply cross-domain tools and technology for a wide range of application sectors by promoting standardization and generating a related strategic research agenda. Figure 2: ProSE supporting activities  linking research and standards. proposing a practicable methodology for their maturation towards their eventual acceptance, so as to enable or facilitate cross-domain compatibility and a higher degree of reusability. This is dependent mainly on software, protocols and interfaces. by delivering a strategic agenda for standardization. This strategic agenda would serve as an input to the future EU and national work programmes, and would complement the ARTEMIS SRA. The project will develop a framework for analysing the present standardization position, and a method by which to determine standardization priorities for embedded systems. The goal is to promote and initiate standards and standards adaptations rather than to write standards, which would be outside the scope (in terms of both time and resources) of this support action. The long-term perspective is the expected take-up by the ARTEMIS Platform. The ProSE project will directly address the complexity challenge by promoting and facilitating new approaches to embedded system design. This is primarily a system and software issue, and is critical in many application domains because of the reliance that people and society place on the services delivered by these systems. It will also contribute to the changeover from 'design by decomposition' to 'design by composition' by supporting existing and emerging standards that will enable it. It will help to better meet the increasing demand for innovation activities in the embedded systems domains by shortening the process of selection of candidate standards, and facilitating the emergence of high-quality standards and of new services, cross-domain products and solutions.